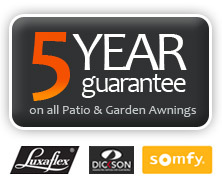 We will listen to your needs as we want all our customers to be fully satisfied with their new awning. We have experience gained from many installations to draw on and we can explain to you what choices are available and how the various options might work out in practise. 1. How should an awning be fixed? Remember to look out for down pipes and guttering that might restrict the height or position at which the awning should be installed. Safety is essential as most conservatory structures are not suitable to withstand the additional stress or weight of an additional structure like an awning. This can be overcome using purpose designed support frames that can accommodate the weight of an awning and deal with the forces it produces. We can also combine these with a wind protection system. 3. Can an awning be fitted to a listed building? Listed buildings can provide planning restrictions and often require planning applications to be made. Our competent design team can provide you with all the information on the system and methods of fixing to support your planning application. 4. What awning is suitable for you? Essentially there are three styles of sun awning system available to purchase in the UK. Fully Cassetted Systems – when the awning is closed, both the arms of the awning and the material that covers it fold into an aluminium cassetted box. This offers protection to the system, prolongs the life span of the awning and is a stylish option. Semi Cassetted Systems – when the system is retracted, the arms of the awning will fold directly underneath the system (staying exposed) whereas the material will fold into the casing. Non Cassetted Systems – these models are permanently exposed to the elements since neither arms or material are encased. When selecting the right awning for you, it is important to assess the pros and cons of each system. A fully cassetted awning will offer the benefits of elegant features in addition to total protection for its components throughout the year. A semi cassetted system is available at a slightly cheaper premium and does afford the same degree of protection offered by a fully cassetted system (regardless of its exposed arms) due to the fact that they are powder coated to protect them from weathering. However to some of our customers, these models are less pleasing to the eye. Whilst Non cassetted sun awnings are often perceived to be more affordably priced, they are not always a good long term investment. The constant exposure of their covers to heavy. 5. Electronic Or Manual Operation? 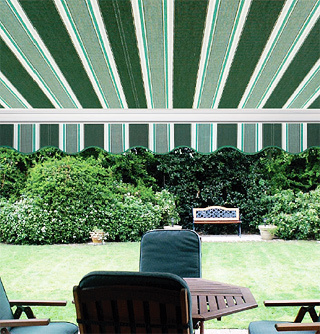 Take complete control of your surroundings with a sun awning system motorised by Midland Patio Awnings. Having your awning opening and retracting automatically creates the perception that someone is at home, even when you’re away on holiday. With a light and wind sensor, your awing will automatically extend in bright sunshine – protecting your furnishings from bleaching and your plants from drying out. If strong winds threaten, the awning will automatically close, ensuring your safety at all times. On larger systems (exceptionally wide systems are very heavy in weight and can be extremely difficult to open and close manually). We usually recommend electronic operation on any model over 4500mm in width for ease of use during changeable weather conditions. Motorisation facilitates the smooth retraction of your awning back into its casing, enabling it to be stored quickly in the event of dramatic climate change. Any motorised system is available with a wide range of control options to ensure your system is protected and operational whether you are there or not. Optional sun and wind sensors will instruct the awning to extend automatically to meet comfort, environmental and security needs. The system will also retract automatically to protect itself and your property from damage during adverse weather conditions.